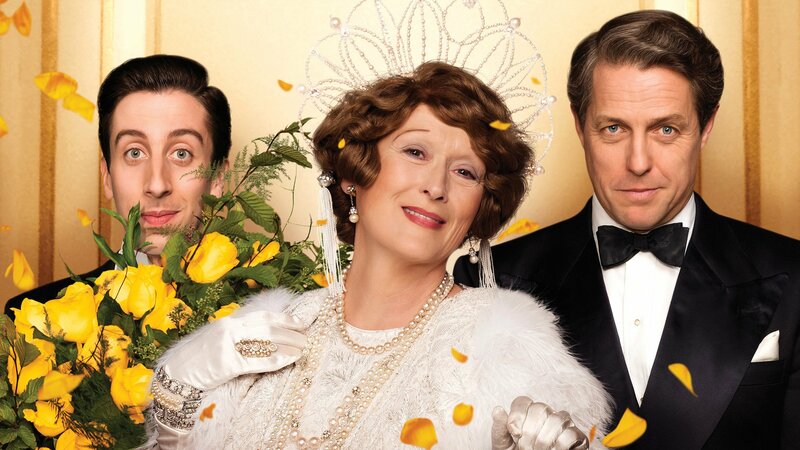 A delightful biographical comedy with a twist—Meryl Streep is neither the Main Character nor Influence Character. What is interesting about this delightful and complete narrative is not that it was based on the true story of an opera singer who became famous for being horrible. Nor is it that it represents an opportunity to laugh and cry amidst a summer swelling with spandex-clad superheroes. Nor is it the performances of Meryl Streep, Hugh Grant, or the new master of expressions of disbelief Simon Helberg. Rather, it is the idea that Meryl Streep, Florence Foster Jenkins herself, is neither the Main Character nor the Influence Character. Within minutes it is clear that St. Clair Bayfield (Hugh Grant) is the Main Character. A washed-up stage actor who never was, St. Clair works tirelessly in order to enjoy the security provided by a woman of substantial means (Main Character Issue of Security, Main Character Approach of Do-er). Married to a woman stricken with syphilis, St. Clair balances his duties to wife with his needs for physical affection and his relationship with his mistress, Kathleen Weatherley (Rebecca Ferguson) (Main Character Problem-Solving Style of Holistic, Main Character Throughline in Situation). St. Clair is driven by any means necessary to keep the machine of Foster Jenkins thrumming (Main Character Problem of Process). His resolute steadfastness in this matter forces him to be sensitive to the negative repercussions of his wife’s singing—the laughing, the derision, and the embarassment (Main Character Resolve of Steadfast, Main Character Symptom of Effect). He responds to these threats to his lifestyle by paying off anyone who might be the reason for adding emotional stress to Florence’s life (Main Character Counterpoint of Threat, Main Character Response of Cause, Main Character Approach of Do-er). Cosmé McMoon is one of those people and in his role as Influence Character to St. Clair, Cosmé finds it challenging to keep a straight face in spite of all the absurdity (Influence Character Concern of Impulsive Responses, Influence Character Problem of Non-Accurate). Cosmé’s biggest fear is that he will become the laughing stock of the musical community by mere association with Foster (Influence Character Symptom of Results). Through St. Clair’s gentle proddings, the relatively young and naieve pianist keeps his head down—refusing to rock the boat (Influence Character Response of Process). One assumes the heart of the story to be between St. Clair and Foster Jenkins; after all, it is the story of a husband doing whatever it takes to keep his wife happy. But that relationship finds thematic exploration in the Overall Story Throughline. The light-hearted manipulations of the music community and the press, Florence’s music lessons and her performances—all in the service of servicing a relationship (Overall Story Throughline of Manipulations). Pretending that Florence is a great singer is the story of Florence Foster Jenkins and the source of the film’s longline and narrative drive (Overall Story Concern of Playing a Role). Her obvious ineptitude to carry a tune fuels every scene and acts as the magnet for almost every single character interaction (Overall Story Issue of Ability, Overall Story Problem of Non-accurate). Reducing outbursts of laughing and fighting for the Jenkins cause extending beyond St. Clair and into the purview of objective characters like the vivacious Agnes Stark (Nina Arianda) (Overall Story Symptom of Effect, Overall Story Response of Cause). Instead it is the relationship between St. Clair and Cosmé that rounds out the narrative and serves as the heart of the story. From the moment the two meet, there is an uncomfortablity factor that suggests both are inadequate at their jobs (Relationship Story Problem of Non-accurate). Working together to keep the ruse up—hiding girlfriends, playing Carnegie Hall, and buying and tossing every last Washington Post—is what brings the two men closer together (Relationship Story Throughline in Activity, Relationship Story Concern of Doing). The expectation to perform and lie threatens to pull them apart, while stark determination and stick-to-itiveness unites them once again (Relationship Story Symptom of Expectation, Relationship Story Response of Determination). In the end, Cosmé couldn’t care less about the quality of his performance—secure in the fact that what he did was good enough. His revelation that “Cosmé McMoon, a boy from San Antonio, Texas played Carnegie Hall” reveals that he now sees things the way St. Clair does (Influence Character Resolve Changed, Influence Character Solution of Accurate). Typically, Failure stories fail because they don’t resolve their Problem with the Overall Story Solution. Here, both are present—a paradox only to a linear mind that requires problems to be either on or off. Florence knows the truth, and in knowing understands her own inadequacy—but that doesn’t matter. For as she puts it—and as St. Clair tearfully agrees with, “People may say I can’t sing, but no one can ever say I didn’t sing.” (Overall Story Consequence of Doing, Story Judgment of Good).